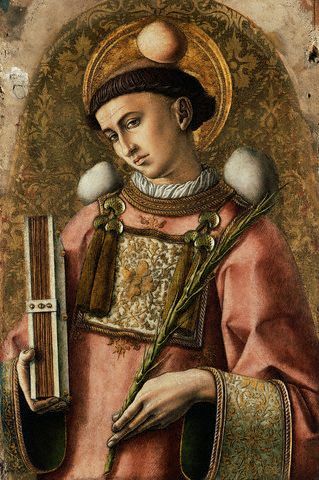 If you’re like me at this time of year, when you hear the name of St. Stephen your mind likely turns first to Christmas carols. The first few verses of Good King Wenceslas probably pop into your head because, as the song mentions, it was today on the feast of Stephen that the kindly monarch looked out. He saw suffering and worked to heal it, educating his page as they journeyed together. More than simply providing a line to rhyme with a description of the snow being “deep, crisp and even,” the link between Stephen and Wenceslas is clear. Just as the page followed in the footsteps of the king, Wenceslas was acting in a manner befitting Stephen who, we are told in the Acts of the Apostles, was one of the first deacons appointed by the apostles. The role of deacon in the early Church included the distribution of food to widows and others in need: hence the connection. In time, Stephen was martyred for his faith. That we celebrate his feast day just one day after Christmas sometimes confounds people. Why remember a death by stoning amid the parties, the gifts, the festive air of the season? Pope Francis addressed this very issue when he spoke to the crowds gathered in St. Peter’s Square on this date last year. Noting the juxtaposition of the serenity and joy of Christmas with such a violent death, the pope went on to explain that the Feast of St. Stephen is a perfect reflection of the deeper meaning of Christmas. The path has already been trod for us. Like the page, like Wenceslas, like Stephen, we can now follow in those footsteps to that new life.